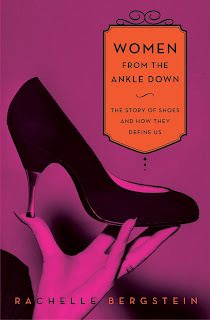 Women from the Ankle Down: The Story of Shoes and How They Define Us by Rachelle Bergstein, $16 on Amazon. Numerous cultures have rituals about feet. History is full of examples of shoes being used to restrict a woman's mobility or declare the wearer's social status. I had hoped Women from the Ankle Down would be an interesting history about the development and evolution of women's shoes that touched on some of these topics, but Women is less history and more anecdotes of American pop culture shoe moments. Pop culture moments aside, the author did present brief histories of Salvatore Ferragamo, Roger Vivier, Manolo Blahnik, Jimmy Choo, Christian Louboutin, Nine West, and Jeffrey Campbell. These sections could have been improved with pictures, which the book was sadly lacking. Fun Tidbits: Salvatore Ferragamo is credited with making the first shoes with arch support. Ferragamo also gave us the cork wedge, which was how he stayed in shoes once war lead to leather rationing. There was a movement in the 1920s to have high heels outlawed in order to keep young women from going out to dance, drink, and cavort with men. Dorothy's ruby slippers in The Wizard of Oz were originally supposed to be silver. Another author mentioned in this book states that birth rates were low in the 70s because women weren't sexually attracted to men in platform shoes. If I had to hazard a guess as to why the birth rate was low at that time, I would think Roe v. Wade (1973) had something to do with it, but I put zero research into that theory. Marilyn Monroe was about 5'5"; Audrey Hepburn was 5'7". For my entire life, I thought Marilyn was tall while Audrey checked in slightly over five feet. This fact about their heights shocked me into staring into space.